Instructions for updating how often you'd like the What's Happening emails to go out. What's Happening emails are sent weekly or monthly and include a summary of notable new content and highlight upcoming events in your community. 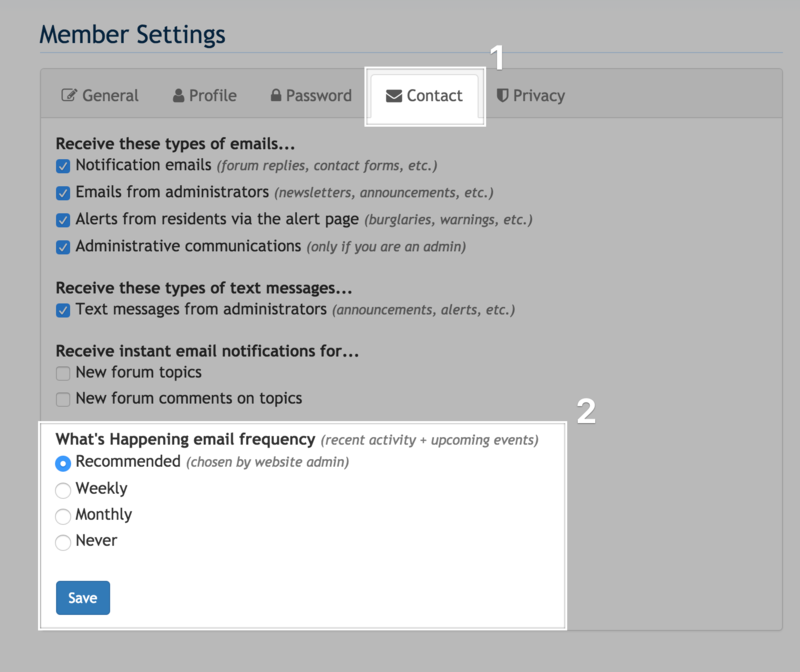 The recommended frequency is determined by the website administrator, and whichever sending frequency they select will be set as the default for members. A full website administrator can update the sending frequency at any time by visiting the "Settings" section in the Admin Control Panel. In here, click on the "Emails" tab and select from the drop-down menu which sending frequency you would like: weekly, monthly, or never. Then, click "Save." Each member can set their own sending frequency preference if they do not want the recommended option set by the website administrator. To do this, first log in and click on your name in the upper right-hand corner. From the drop-down menu, select "Member settings." In here, click on the "Contact" tab, and under the section labeled "What's Happening email frequency," select your desired option. Once you've finished, click "Save."